“I just want to say that this was not my idea,” my mother in law, Sue, reminded us as we ended up idling the aisles of the tiny garden centre that lives to the side of North Dulwich station, last bank holiday weekend. Between you and me, it was I who had orchestrated this outing. It was born out of what felt like a physical need to be surrounded by plants, and the quiet bumblings that surround them. 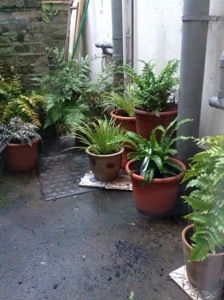 The weekend before I had escaped there in need of some plant therapy and after just a few moments of frond-stroking, I could feel any worries I had leak out of me and settle amongst the cool puddles of water that lay undisturbed on the ground. I knew I had to get back there but there always seemed more pressing things to do. Things that had to be written down onto a list. Things that reminded me of a butterfly desperately fluttering its wings but unable to take off. “What do you really want to do?” Sue said to me when I’d explained about the list of things. “I want to make a fern garden,” I said. “Let’s do that then,” she said simply and that afternoon, that’s exactly what we did. I don’t need to go to a garden centre anymore. I have my own tiny piece of green in my corner now and you know the funny thing, I haven’t had to look at my list of things again.